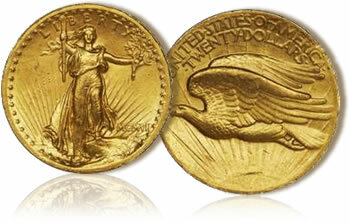 Dallas, TX — Continuing an annual tradition begun in 1996, Heritage Auction Galleries has awarded a Mint State High Relief [Saint-Gaudens] double eagle to Steven Strom, a collector from Idaho. The valuable rare coin was the Grand Prize in the 15th Annual Survey of Clients conducted by Heritage. The coin has been certified by NGC as a Wire Rim MS-60. "Steven Strom’s numismatic journey will be familiar to many collectors," said David Mayfield, Vice President of Heritage Auction Galleries. "His interest in rare coins started as a kid, collecting Jefferson nickels and Mercury dimes out of circulation. What may be more intriguing is that he has continued specializing in Full Step Jeffersons, pursuing ever-higher Registry ratings for that series, and currently capturing the #1 spot in 14 categories." Mr. Strom’s other interests and activities are also fascinating, and tell much about the work ethic and faith that underlie his four-decades in Idaho. Despite owning two restaurants, he continues working as a part-time UPS driver. He loves history in many forms, he collects and restores automobiles and teaches others how to restore them. He is a collector of other antiques, as well and is active in prison ministry, church leadership and recently produced a CD of family music. As Mr. Strom tells his story, it all seems a bit simpler. "I like to keep busy, and I like to give back to the community," he said. "I continued collecting Jefferson nickels because I could afford them even when I started to grow more serious about top-graded examples." "Previous High Relief winners have been from Arizona, California, Colorado, Florida, Illinois, Indiana, Kansas, Maryland, Michigan, New York, Virginia, and Washington," said Mayfield. "Our growing global client base means that one of our international collectors will one day be the lucky recipient." The 1907 High Relief Double Eagle, with its date as the Roman numerals MCMVII, is generally voted the most beautiful American coin ever minted. It also enjoys popularity as a first-year-of-issue coin, and a less-than-one-year type, with a tiny mintage of 12,367 pieces. The High Relief double eagle is on nearly every collector’s wantlist, and is avidly pursued at every coin show and auction where it appears. Even novice collectors quickly become aware of the fascinating history of the coin, starting with President Theodore Roosevelt’s desire to improve the aesthetic qualities of America’s coinage. Roosevelt selected sculptor Augustus Saint-Gaudens for the project, and his vision included an appreciation for the coins of ancient Greece, with their high relief designs and strong artistic traditions. Understanding that a nation’s coins are among the most enduring records of its arts and values, TR wanted coins that would embrace American ideals for all-time. Unfortunately, production problems (multiple blows were required to bring up all of the details) and stacking problems in banks limited its commercial usage. Before 1907 expired, reduced relief versions of the basic design were being produced bearing the date in Arabic numerals. Want to get the up-to-the-minute updates and breaking news stories about Heritage Auctions? Get them as they happen at: Twitter.com/HeritagePress; Twitter.com/JimHalperin; Facebook: Heritage Auction Galleries.